New York, The Solomon R. Guggenheim Museum, Andy Warhol, Cars, September-November 1988, pp. 38 and 138 (illustrated in color). "I think everybody should be like a machine. I think everybody should be like everybody" (A. Warhol, interviewed by Gene R. Swenson with Andy Warhol, first published in Artnews (New York), vol. 62, November 1963, pp. 60-63, reprinted in Andy Warhol: 1928-1987, Jacob Baal-Teschuva ed., Prestel-Verlag, Munich, 1993, pp. 131-32). Andy Warhol saw the machine as an ideal model for existence - simple, likeable, monotonous, and highly capable. As such, he cultivated a robotic public self-image. He also wanted people to judge him by his exterior, and nothing more, thus he rarely divulged biographical details. The artist developed a method of creating art at a highly efficient speed via the silk-screen, using repetition and appropriation to diminish individuating marks. As Paul Bergin writes in an essay on the artist, "The machine is, to [Andy Warhol], a way of life, representative of a unique field of twentieth-century experience, and all of [his] art is striving to express the machine in the machine's own terms" (P. Bergin, "Andy Warhol: The Artist as Machine", Art Journal, vol. 26, No. 4 (Summer, 1967), p. 359). 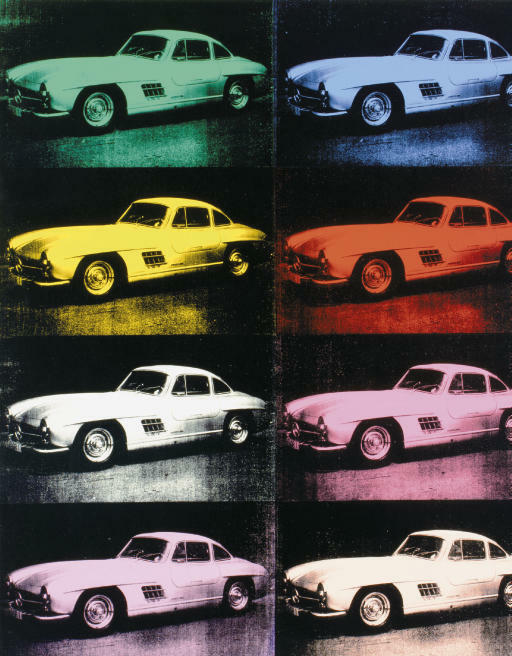 In 1986 Warhol made a portrait of the ultimate machine that had long stood to represent American life: the 1950s automobile. Mercedes-Benz 300 SL Coupé, pictured in the present work, is a symbol of post-war prosperity and America's fascination with the packaged image of a sleek, accessorized, and lucrative life-style. Repeated eight times, the loaded symbol of the car is at once exacerbated and deflated. The romance of the object - its sexiness and appeal - is blown out of proportion and fetishized to a point where its banality battles with its appeal. This process lies at the heart of much of Warhol's seminal works, such as the Brillo Boxes, Campbell's Soup Cans, the Marilyn and Elvis portraits. Warhol indulges in the American fascination with objects, status, beauty, and fame, reveling in the lack of consciousness precipitated by obsessive material desire.